In 2015, Portugal introduced a voluntary ‘pirate’ site-blocking regime against torrent, streaming, and similar sites, with zero court orders needed. Now the campaign has been extended to include the blocking of live sports streams, initially soccer matches. Again, the process is entirely voluntary with no injunctions required. In July 2015, Portugal’s Ministry of Culture announced the signing of a an anti-piracy memorandum between the General Inspection of Cultural Activities (IGAC), the Portuguese Association of Telecommunication Operators (APRITEL), various rightsholder groups, the body responsible for administering Portugal’s .PT domain, and representatives from the advertising industry. The aim of the memorandum was the creation of a super-streamlined anti-piracy mechanism which could be triggered following complaints from rightsholders. As a result, local anti-piracy outfit MAPINET regularly collates evidence on pirate site activities and ISPs block the platforms, with no court intervention required. Since then, a huge number of sites have been blocked, with new domains added to the country’s unofficial blacklist every month. At the time of writing there are more than 1,900 sites blocked in the country, many on copyright grounds. Now, however, there appears to be a significant new addition to this controversial scheme. With what appears to have been little if any public scrutiny, back in December a new agreement was signed between IGAC, APRITEL, and rightsholder groups including FEVIP and GEDIPE. The aim was the protection of live sports with the introduction of a regime to block ‘pirate’ streams of live sports broadcasts. 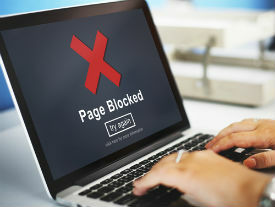 Discussions online indicate that those accessing recent live matches were interrupted by ISP blockades which prevented them from accessing unauthorized platforms. After being questioned by local publication Exame Informática, IGAC confirmed that the practice is indeed going ahead as per the December agreement. “Live events, by their very nature and under penalty of futility, require a faster action of the entities involved in the course of unauthorized transmissions,” said IGAC Inspector General Silveira Botelho. Botelho told the publication that the original memorandum wasn’t designed to combat illicit streams of live sports. The new agreement, however, operates on information obtained shortly before live events get underway, in order to block illicit transmissions more effectively. As usual, rightsholders provide the initial notification to IGAC which then makes the decision whether or not to block the resource. Instructions are then handed to ISPs to block the online locations associated with the illegal streaming activities. Unlike the regular blocking process, bans aren’t permanent but are lifted as soon as the events the rightsholders wish to protect have been concluded. This appears to be similar to the blocking activities carried out in the UK by the Premier League and a pair of boxing promotions (1,2). The difference is that these are fully authorized by High Court injunction whereas the Portugal efforts are entirely voluntary. “The agreement applies to all live events and is open to the inclusion of other entities that wish to contribute to the achievement of the objectives therein and to accept the respective terms and conditions,” says IGAC’s Botelho. While all live events are covered by the memorandum, reports online suggest that only soccer matches have been affected thus far. The blocking was confirmed by Revolução dos Bytes (Bytes’ Revolution), the group behind SitesBloqueados.pt and site unblocking service Ahoy!, who told TorrentFreak that there has been a ‘huge’ increase in new detected blocked sites. “I’m worried about this new easy and expedited way of blocking sites, it probably means that they have developed a new tool for this particular purpose, making the process of censoring sites less tedious and with even less red tape,” team member Henrique Mouta says. In any event, the Ahoy! tool is still being updated to unblock affected sites, although Henrique says the team are having to do “a lot more work” to keep up with the increased volume.